The Oklahoma Pinto Horse Association held the Annual Awards Banquet and State Meeting at the Riverbend Ranch Arena Banquet Hall. Approximately 110 members and guests celebrated the start of the 60th Anniversary Year of Oklahoma Pinto Association! Those attending enjoyed a delicious buffet meal catered by Riverbend’s Alyssa Sanders. The 60th Anniversary cake was a great start to a year of celebration. State Director Don McGee gave an inspirational talk and Pinto Executive Vice President and COO, Darrell Bilke was the guest speaker. 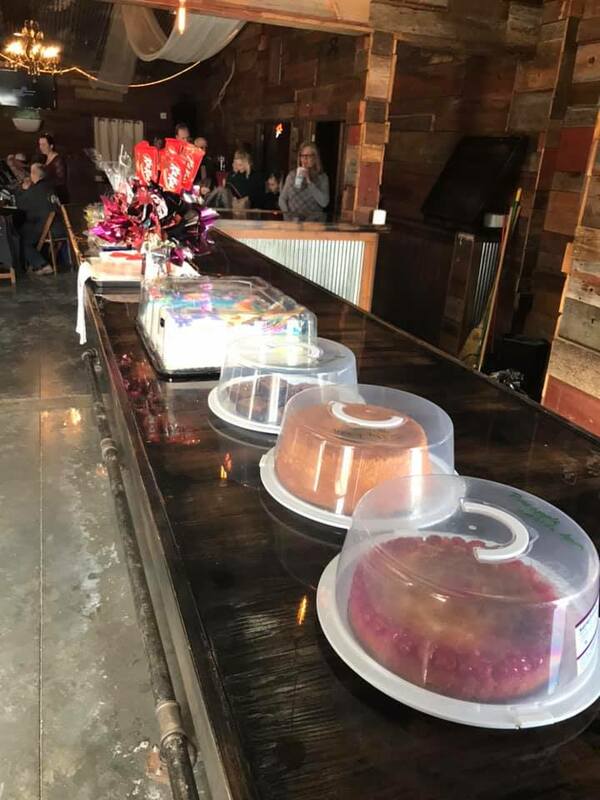 OPtHA Youth served up delicious bake sale items for the live auction led by Payton Marlin, a very skilled 10 year old auctioneer. Payton pulled great prices from the crowd! Many of the OPtHA members brought silent auction items and they were actively bid on by all. The 2018 recipient of the Pat Walliser Sportsmanship Award was Alexandria DelGrosso. President Frankie Allen recapped the 2018 shows—record attendance and record stall sales. 2018 Sponsors were acknowledged and applauded for their support. 2018 & 2019 Vice President Kevin George gave the financial report. 2018 Board of Directors and Executive Committee, Frankie Allen President, Kevin George Vice President, Sherri Pledger Treasurer, Emily Allen Recording Secretary, Ricky Payne, Rebecca Roberts, Stephen Jardot, Kristin Stolle and Carrie Moody were thanked for their service. The 2018 Board of Directors presented Frankie Allen and Ricky Payne with personalized Directors’ Chairs. The 2019 Directors and Executive Committee President Kristin Stolee, Vice President Kevin George, Treasurer Sherri Pledger, Recording Secretary Carrie Moody, Frankie Allen, Rebecca Roberts, Stephen Jardot, Melissa Shot, Laura Winfield , Pam Bennett, and Luc Kilgore were acknowledged. Incoming 2019 President Kristin Stolee gave a talk on upcoming shows and events for 2019. 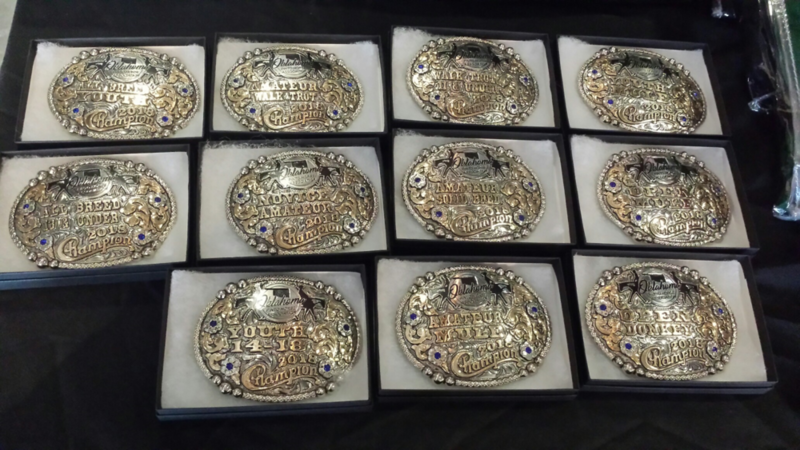 The 2018 Year End Awards were Buckles for Division High Points, and Trophies for Halter High Points and Class Awards. Presenting the awards by popular demand was beloved Gate Man Ricky Payne, who announced his retirement. Announcing the awards was OPtHA Announcer Chris Maxwell. 20 High Point Division Awards and 7 Halter High Point Awards and 43 Class Awards were given to 2018 loyal exhibitors—well deserved! Buckles were sponsored by Angela Fowlkes and Halter Awards were sponsored by Jan Cozort-Cozort Homes! Thanks to all and Happy 60th Anniversary OPtHA! The Oklahoma Pinto Horse Association Banquet was a huge success with 106 attending and enjoying a buffet luncheon at the River Bend Event Hall. Great participation on the Bake Sale Auction led by Lynn Pennick; a total of $1,900 was brought in for the Tabitha May Scholarship Fund. The Silent Auction was a success with members donating $900. Our 2018 Tabitha May Memorial Scholarship award winners were Megan Olson and Colton Carter. Congratulations! With the passing of our longtime, faithful member and past officer, Pat Walliser, OPtHA has implemented an Annual Sportsmanship Award in her memory. The first annual Pat Walliser Sportsmanship Award recipient is Amber Smith. Congratulations! Mr. Darrell Bilke, Chairman of the Pinto Horse Association, was our guest speaker and informed all of new directions in Pinto nationally. Elections were held and new board members and officers were installed, President Frankie Allen; Vice President Dawn DeAmico, Treasurer Deborah Sementi, Recording Secretary Kristi Rymel, Directors Board Members Doyle Reimer, Teresa Strode, Ricky Payne, Kevin George, Stephanie Horine, Emily Ediger. Additional Board members added at first Board Meeting, Kathey Childers and Show Secretary Rebecca Roberts. 2018 Class Winners received coolers and Reserves received leather halters: Full list of class winners can be seen on the Awards page. Register for our upcoming show!